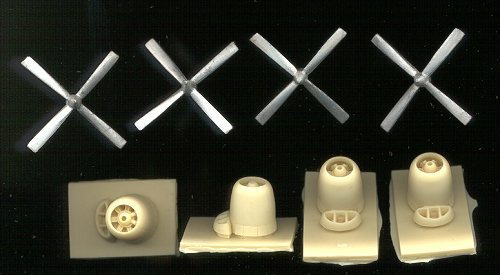 If you own the Minicraft 1/144 Boeing Stratocruiser, you know that the biggest problem with the kit are the engine nacelles and the propellers. The kit nacelles are totally devoid of detail and the props are not exactly what the real aircraft used. Well, there is no reason to let that kit languish on your build pile. 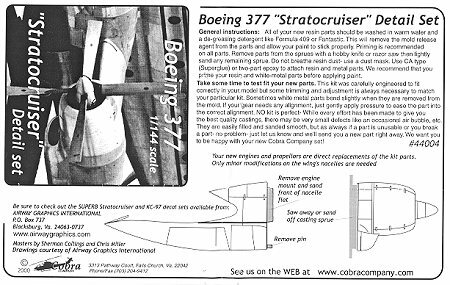 Cobra Company has come to the rescue with a set that includes replacement engine cowlings and new propellers. The engine cowlings are superbly cast in resin. The example sent to our editorial headquarters are superbly molded and totally devoid of any air bubbles, resin crud or flash. The propellers are in cast metal so that all you need to do is remove the tiny mold seam and polish them up. The instructions that come with the set are simple and to the point. You get a photo of what the cowling and prop should look like and instructions on what to remove from the resin cowling. There are also instructions on what part of the kit needs to be modified. Cobra Company is no longer making its products available to distributors. That means that you must order direct from Cobra Company. For more information on this set, use the link given below. This set is really superb and has been needed for quite a while. For those of you with the 1/144 KC-97, don't fret as there is a set for you as well.